Heirloom Canna Roma is a popular canna and is very often found growing throughout Australia. Roma has been around for many years, it was raised by Carl Sprenger around the 1890s in Italy. 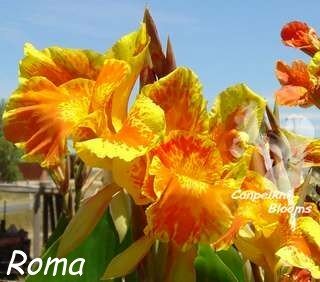 Roma has big often frilled flowers that are orange overlaid with darker orange markings and splotches. The flowers have an irregular bordering of golden yellow. Roma's flowers are quite wide and generally reach around 5 inches wide. Like most other tropical plants the foliage of Roma is green. Roma is one of the easy growing cannas and increases its rhizomes very well. This cultivator is another of the tall growing garden plants, reaching easily up to 2 meters in the garden. 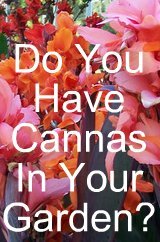 Roma is sterile and therefore does not set any canna seed. 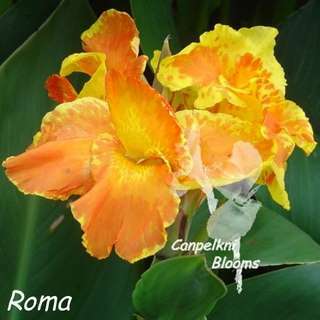 There are a few other cannas that look familiar to Roma with their orange and yellow coloring. The earliest reference I could find for Roma being in Australia is from 1922, but I believe it was here well before that. 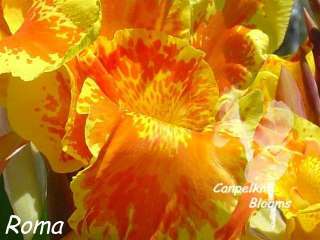 Roma is often confused with a few other cannas, this plant can be found being called by these other canna names, Yellow King Humbert and Florence Vaughan.